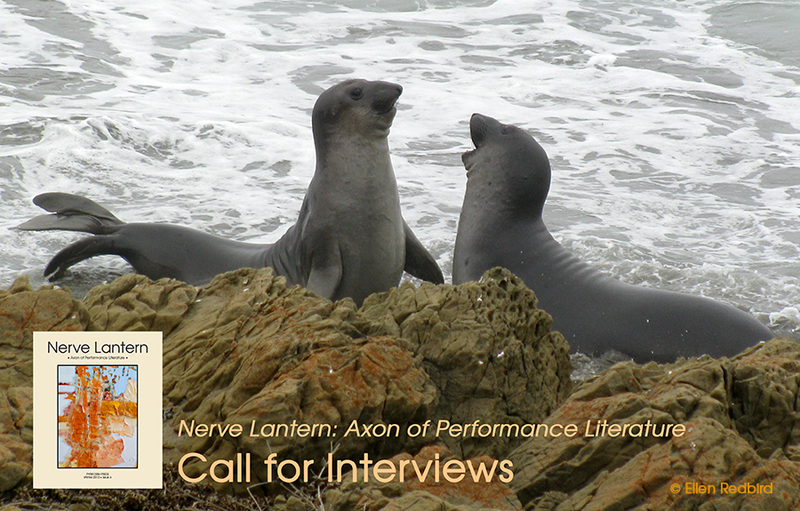 Nerve Lantern: Axon of Performance Literature is seeking interviews for future issues of the journal, including the forthcoming issue 7. (1) Interview a performance writer about performance writing and related topics. (2) If you are a performance writer, co-conduct a two-way interview/conversation with another performance writer about your different views on writing for performance, performing a text, and related topics. (3) Interview someone about performance writing or some other topic. Turn this interview into a performance piece. Write mise en scene into the text, e.g. set, props, movement, location, sound/music, visual effects, audience participation, choruses, etc. Whether meant to be performed on stage, in the street, in film, or only in the imagination, make your mise en scene something that vivifies, complicates, unravels, makes strange/absurd, or opens up the ideas and language in the interview/conversation. Please be sure the interviewee approves of your turning the interview into a performance piece, or you can collaborate on shaping it together. (4) Make it a multi-person interview/conversation. Be as illuminating or confusing as you like, but make it related to performance literature. (5) Write a fictional interview. Make it performative or about performance.